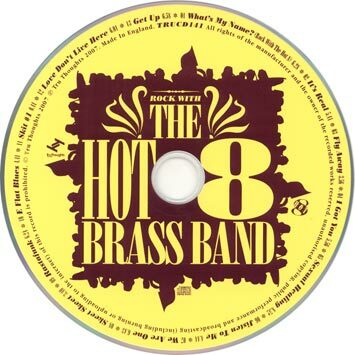 Following up from the highly anticipated release of the 'Sexual Healing' single - the much sought after cover version of the Marvin Gaye classic which sold out in a few days and has already been selling on Ebay for big amounts, the Hot 8 Brass Band present their full length album - Rock With The Hot 8. Hailing from New Orleans, the Hot 8 formed in 1995 and are the first US signing to Tru Thoughts. Their unmistakable fusion of modern styles and brass standards transcends both genres and audiences alike. Deeply affected by Hurricane Katrina, the members of the Hot 8 have been actively involved in both the political and social issues surrounding the aftermath . The Hot 8 are well respected members of the musical community, and are dedicated to anti-violence campaigns, using their vibrant, energetic music to project this message. Four members of the band have died, two of which because of violent acts on the streets of New Orleans, but their loyalty to their community combined with the unmistakable Jazz spirit has earned them enormous credibility with their audiences and fellow musicians. The Hot 8 recently appeared in the poignant documentary 'When the Levees Broke' by Spike Lee, pushing their profile as one of New Orleans' most respected bands into the spotlight. Rock with The Hot 8 combines the traditional with the contemporary - Brass band covers of classics such as 'Sexual Healing' and Snoop Dogg's 'What's My Name?' 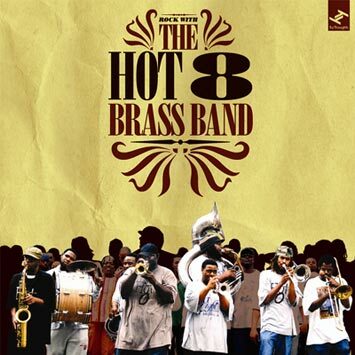 along with original material by Hot 8 - This album is a prime example of how traditional styles can be brought to new audiences, the Hot 8 bring an instant 'cool' to Brass Band music whilst maintaining it's credibility as one of New Orleans greatest treasures. This album is set to put post-Katrina New Orleans back in the public eye for the right reasons, showing that in contrary to recent media speculation, Hurricane Katrina did not wash the heart out of New Orleans music, and that it is as prevalent as ever. The members of the Hot 8 were all born and raised in New Orleans; many of them began playing together in high school. 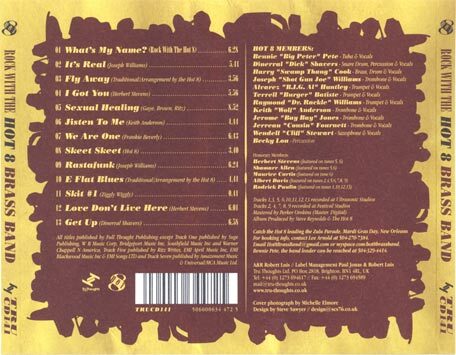 In 1995 they came together and began playing traditional New Orleans brass band music professionally. Founded by Bennie Pete, Jerome Jones, and Harry Cook in 1995, the band has played in traditional Second Line parades hosted each Sunday by a Social Aid and Pleasure Club ever since. 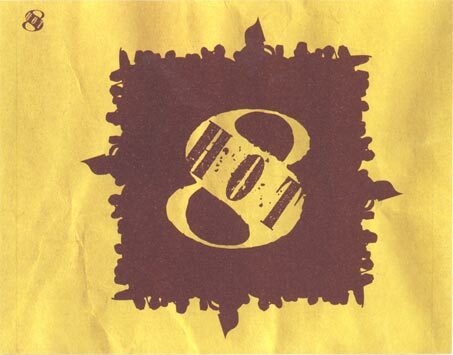 The Hot 8 are famous for playing all day in the sun, then hopping to a club gig and playing through the night. But even more than their boundless energy, what makes the Hot 8 special are the sounds they coax from their well-loved, well-worn horns. 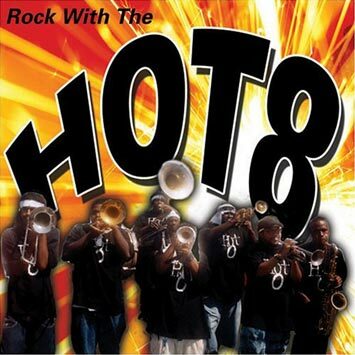 The Hot 8 Brass Band has toured in Japan, Italy, France, Spain, Finland, England, and Sardinia. They play regularly at the New Orleans Jazz & Heritage Festival ("Jazz Fest") and have played in the Village Halloween Parade in New York City, the Putumayo World Musics Concert of Thanksgiving in New Orleans, the Mardi Gras day Zulu parade, San Antonio Zulu Association Festival, the City of New Orleans New Year's Celebration and Mo' Fest, the Tom Joyner Morning Show, and the Master P music video Hootie Hoo. Following Hurricane Katrina and the devastation wrought upon New Orleans, The Hot 8 became the featured band in the SAVE OUR BRASS! relief project, which brought music to evacuee shelters, temporary trailer parks, and communities that have reached out to New Orleanians. As a result, the Hot 8 Brass Band have been featured on CNN, Nightline, WDSU-TV (New Orleans) and in the New York Times.